Our personal care Soap bars from colgate palmolive, dial, and dove are top quality soaps for use at home, work or in hotels. Irish spring and dial are 2 of the best selling soaps of all time. Keep quality soap at your kitchen and bathroom sinks for clean hands. Dial Antibacterial Deodorant Bar Soap - 3.5 Oz. Dial Antibacterial Deodorant Bar Soap - 4 Oz. Procter and Gamble Safeguard Bath Bar Soap - 4 Oz. Unilever Best Foods Dove Gentle Exfoliating Bar Soap - 4.25 oz. 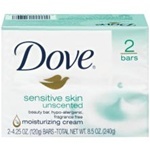 Unilever Best Foods Dove Sensitive Skin Bar Soap - 4.25 oz. Unilever Best Foods Lever 2000 Original Bar Soap - 4 oz. Dove Bar Soap Go Fresh Cool Moisture - 4.25 Oz. Ivory Bar Soap Wrapped - 3.1 oz. Dove Bar Soap Pink - 4.25 Oz. Irish Spring Aloe Bar Soap - 3.75 oz. Irish Spring Original Bar Soap - 3.75 oz. Zest Bar Soap Cleansing Washing Personal Aqua - 3.2 oz. Irish Spring Bar Soap Clean Scrub 3 Bar - 3.75 Oz. Irish Spring Bar Soap Icy Blast 3 Bar - 3.75 Oz. Irish Spring Bar Soap Moisture Blast 3 Bar - 3.75 Oz. Dove Mens Extra Fresh Bar Soap - 8 oz. Dove Deep Clean Mens Bar Soap - 4.25 oz. Zest Aqua Bar Soap - 12 oz. Zest Bar Soap - 3.4 oz. Palmolive Green Regular Bar Soap - 9.6 oz. Bulk Bar Soaps for bathrooms, hotels and motels keep your employees and patrons hands sanitary and keep germs from spreading.